Remote deposit is a way to process payments without sending paper checks to your bank or credit union. By scanning (or snapping) an image of checks instead of moving physical documents around, the result is faster deposits and fewer errors. Businesses: Businesses were the first users of remote deposit technology. Organizations see a large volume of checks, and they need to get funds available quickly for operations, payroll, and expansion. Individuals: Consumers also appreciate the convenience of making remote deposits. Busy individuals now demand accounts that let them deposit checks with a mobile device, saving trips to bank branches. Other organizations: Nonprofits, government bodies, and other organizations use remote deposit. The technology is widely available, and organizations can choose less-expensive services and hardware options when that makes the most sense. This page primarily focuses on business use. For details on making deposits to a personal checking accounts, see How to Make Mobile Check Deposits. For small businesses and organizations that don’t receive many checks, a mobile device is a perfectly good solution for remote deposits. For other situations, dedicated hardware makes quick work of a large number of checks. Imaging: To deposit checks remotely, you need an image of the check. You send the image to your bank, and your bank begins the process of collecting money from the check writer. As a result of Check 21 legislation, your bank converts those images into a substitute check, which can replace the original paper document. Check scanners and mobile devices: Traditionally, businesses used dedicated check scanning machines. Remote deposit scanners can cost a few hundred dollars or a few thousand depending on your needs, such as how much volume you do. Some banks just charge a monthly fee for a scanner, and some provide a free scanner as a promotion to win your business. But, expensive scanners are not always necessary. For low-volume users, some banks let you use a standard computer scanner, a fax machine, or your phone’s camera to capture images. Data entry: Depending on your service provider, you may need to enter the amount of your deposit, or the remote deposit system may handle all of that for you. Artificial intelligence is improving the accuracy of automated reading, and you may appreciate that function if you process a high number of checks each month. Post-scan: After scanning, keep the paper checks until your bank allows you to destroy them. Banks may need to see a better image, and they may even want a paper copy of certain checks. Follow your bank’s instructions, and set up a process that helps you avoid depositing the same check twice. A primary benefit of a remote deposit service is that you can ignore “banking hours.” Most banks allow you to process your checks late into the evening (until 10:00 PM or so in some time zones) to beat that day’s deposit cutoff time. In many cases, your bank makes funds available to you within one business day (although you’ll occasionally face holds). That’s great news, and you might think it’s due to the technology, but here’s the bad news: The money didn’t really move that fast. 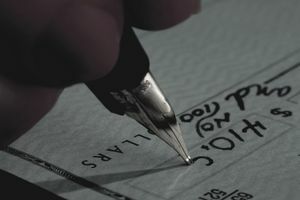 Your bank simply assumes that checks won’t bounce, but it may take several weeks to know for sure if the check is good. During that time, you’re allowed to use the money, but you’re responsible for the deposit. If the check bounces or is returned for any reason, the bank will deduct those funds from your account, and if your account goes negative you’ll have to deal with it (not to mention any bounced check fees that your bank charges). If you’re concerned about checks your customers write, take steps to avoid bad checks. You can even sign up for a check verification service, which help to identify problems, and which might also pay you if bad checks slip through the cracks. Most banks and credit unions can help you set up remote deposit. If you’re a consumer, it’s particularly easy—download your bank’s app, and it’s probably already there. Businesses need a deeper relationship with a financial institution. They may need specialized hardware, and it’s essential to understand how your business account works (fees for each check, for example, and alternative ways to accept payments from customers). You may even want to outsource payments through your bank’s treasury management or lockbox service. Banks and third-party service providers are eager to provide remote deposit capture services to businesses and consumers. It makes life easy for customers: Deposits are faster, and they’re much more convenient. Remote deposit is less labor-intensive for banks. The customer creates the image so the bank doesn’t have to, and no teller or branch location is required. Remote deposit should save you time, and it might even save you money. You can skip trips to the bank, armored car services, and time waiting on check float. But, there are tradeoffs. There’s always a chance that your remote deposit system will have errors. By automating things, you run the risk of errors—and the problem is magnified with large volumes. On the other hand, when the system works well, you virtually eliminate human errors. You also have to worry about new legal issues when you switch to remote deposit. Since you’re not sending checks to the bank, you have to follow rules about how to handle the checks after you scan them. Ask your remote deposit service provider for suggestions on how to stay compliant. Borrowing Money at Prosper.com: How Does It Work?